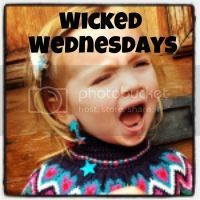 This is another #wickedwednesdays post linking with BrummyMummyOfTwo! H has been exploring everything… Taking my slippers off my feet, into and under everything, to taking the radiator caps off the ends. She has been getting faster while on the move, almost running while holding our hands and really babbling away. She also loves, and I mean LOVES trying to make us laugh, peekaboo is a huge favourite. Yesterday she fed me her toast and she absolutely loved feeding mummy. She shrieked with delight when I mmmmm’d away while eating the a teeny tiny corner of her toast. She loves exploring and will squirm round in her highchair when we’re out to see what going on around, the. Try to make anyone she gets eye contact with the smile or laugh. Little cutie pie! So what are my favourite posts this week… Well it absolutely has to be 6 Things Only A Parent Would Say, which was very kindly retweeted by Britmums and earned me a rather big spike in my webstats! However, I also have to mention my #ThrowbackThursday from last week… My 80s Hits Tape, which has been favourited by Helen. Julie Downes recently posted…Trying to get that lovely sibling photo!